In the wake of turbulence in the financial markets, it's worth reviewing the legal protections available for assets held by banks, credit unions, and securities dealers. Generally, deposit accounts at banks and savings and loans insured by the Federal Deposit Insurance Corporation (FDIC) are insured up to $250,000 per depositor per bank. FDIC insurance covers both demand deposits (those that provide immediate access to cash, such as checking, NOW, and savings accounts as well as money market deposit accounts) and time deposits, such as certificates of deposit (CDs). It covers both principal and any interest accrued as of the date that an insured bank closes. FDIC insurance does not cover mutual funds, stocks, bonds, life insurance policies, annuities, or other securities, even if they were bought through an FDIC-insured bank. 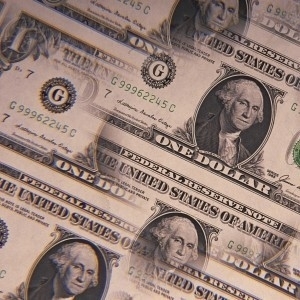 It also does not cover U.S. Treasury securities (because they are backed separately by the full faith and credit of the federal government as to the timely payment of principal and interest) or safe deposit boxes. You can't increase your protection simply by opening more than one account in your name at the same bank. For example, splitting the money between a checking and a savings account or opening accounts at different branches of the same bank do not increase your coverage. However, deposits that represent different categories of ownership may be independently insured. For example, a joint account qualifies for up to $250,000 of coverage for each person named as a joint owner. That coverage is in addition to the $250,000 maximum coverage for each person's aggregated single-owner accounts at that bank. For example, a married couple with three accounts at one bank--they each have $250,000 in an individual account, and they also have $200,000 in a joint account--would qualify for FDIC insurance on the entire $700,000. There also may be additional safety nets. In some states, a state-chartered savings bank is required to have additional insurance to cover any losses beyond the FDIC limits. Some banks also may participate in the Certificate of Deposit Account Registry Service (CDARS), which enables a bank to spread large CD deposits among multiple banks while keeping the amount at each individual bank, including the original bank, within FDIC insurance limits. You do not have to be a U.S. citizen or resident for your account to receive FDIC protection. According to the FDIC, no depositor has ever lost a penny of funds that were covered by FDIC insurance. An online calculator at the FDIC's website, www.fdic.gov, can help you estimate the total FDIC coverage on your deposit accounts. NCUSIF insurance is similar to FDIC insurance; it covers share accounts, share certificates, and share draft accounts but not investment products sold through a credit union. It covers single-owner accounts up to $250,000 per customer per institution. Retirement accounts such as IRAs and Keoghs have separate coverage up to $250,000. 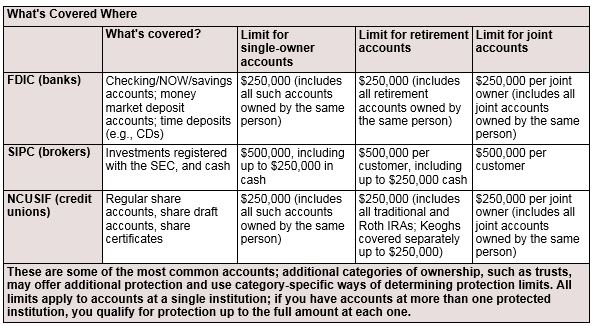 As with bank deposit accounts, independent coverage may be available for different categories of ownership. You can estimate your existing coverage by using the calculator at the NCUA's website www.ncua.gov. An investment in a money market mutual fund is not insured or guaranteed by the FDIC or any other government agency. Although the fund seeks to preserve the value of your investment at $1 per share, it is possible to lose money by investing in the fund. Before investing in a mutual fund, carefully consider its investment objectives, risks, charges, and expenses, which are contained in the prospectus available from the fund. Read the prospectus before investing. SIPC was created by Congress in 1970 to help return customer property if a broker-dealer or clearing firm experiences insolvency, unauthorized trading, or securities that are lost or missing from a customer's account. Many brokerages also extend protection beyond the SIPC limits with additional private insurance. If a member firm became insolvent, SIPC would typically either act as trustee or ask a court to appoint a trustee to supervise transfer of customer securities and cash. The SEC requires brokerages and clearing firms to segregate customer accounts from their proprietary assets and funds. SIPC covers a maximum of $500,000 per customer (including up to $250,000 in cash) at a given firm. SIPC doesn't protect against market risk or price fluctuations. If shares lose value before a trustee is appointed, that loss of value is not protected by SIPC. In general, SIPC covers notes, stocks, bonds, mutual funds, and other shares in investment companies. It does not cover investments that are not registered with the SEC, such as certain investment contracts, limited partnerships, fixed annuity contracts, currency, gold, silver, commodity futures contracts, or commodities options. Additional information about SIPC protection and an explanatory brochure are available at www.sipc.org.